The middle section of Priory Avenue is lower than that nearer the river suggesting that flooding is more likely to be caused by water emerging from the rain water gullies in the road – which might happen if a flap valve opening onto the river does not close properly. Click on the map to view a larger version. 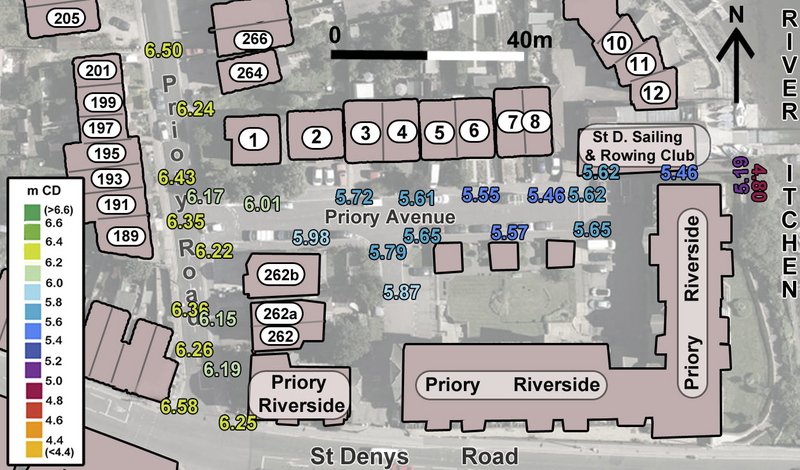 Land heights outside, or nearby to, properties in the Priory Avenue area. Important: The resulting spot height values refer to the land around properties or, for roads the lowest point, that is the rain water gutter next to the kerb. The height of the ground floor level in a property will be significantly higher than the land outside the property – this must be taken into account when assessing flood risk.